Some guys gripe about their exes over a beer; New York City-based artist Sebastian Errazuriz commemorated his with a series of three-dimensionally printed shoes. Presented at Design Miami in partnership Melissa Shoes this past December, 12 Shoes for 12 Lovers is a compendium of one-night stands, short-lived trysts, and doomed romances, evocatively captured in flagrante delicto. By turns racy, whimsical, provocative, and even borderline offensive—particularly when paired with Errazuriz's no-holds-barred personal anecdotes—each sculptural masterpiece offers a voyeuristic window into the human condition. At first, Errazuriz tried to exorcize his exes by painting their portraits, but obtaining their permissions proved difficult. He then toyed with the idea of shoes because “women love shoes, and in a tiny way, a part of their identity gets trapped there,” he told the New York Post. “I thought it would be ironic if I myself tried to capture a part of the personality of each one in a shoe,” he added. Using a a MakerBot Replicator 2X Experimental 3D Printer, Errazuriz summed up his paramours using key traits. Using a a MakerBot Replicator 2X Experimental 3D Printer, Errazuriz summed up his paramours using traits he remembered them by. “Honey,” a bright yellow wedge with an intricate honeycomb design, is based on a woman whom Errazuriz considered too sweet for his own good. “Crybaby,” which resembles a foot splashing into a puddle, tells the tale of a heartbroken lover who showed up at his door in tears. 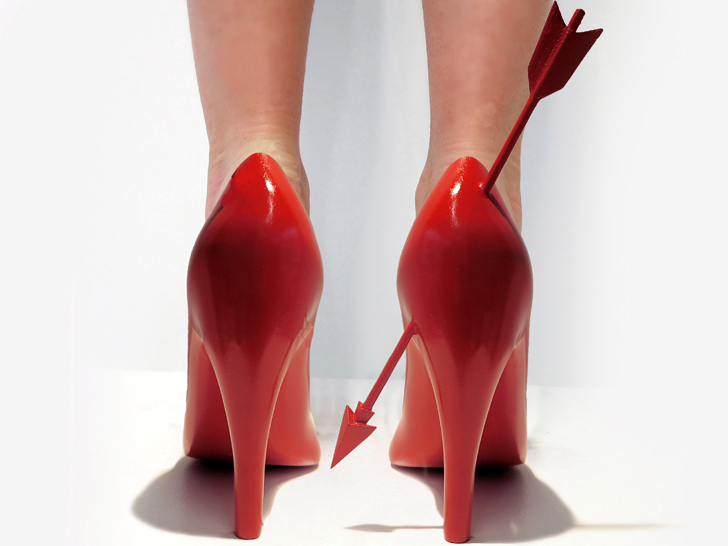 “Heart-Breaker,” a red pump pierced through the heel with an arrow, represents the girl who broke his heart, while “G.I. Jane” is a paean to an ex with a military general for a father. “The Virgin”, which features the likeness of the Virgin Mary, symbolizes the innocence of a former flame (who may or may not have become a nun). “The Rock,” an ode to the one who got away, is the only unwearable piece among the group. Perhaps Errazuriz means it to serve as a reminder that no matter how much we wish it otherwise, relationships, like shoes, don’t always fit.